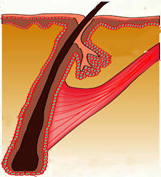 Graying of hair is an inevitable accompaniment of aging and one of the first signs that we are growing older. Graying is also written as ‘greying’ and in India it is more commonly called ‘whitening of hair’. Unlike baldness it occurs in both makes and females with equal frequency and severity, and unfortunately there is no permanent cure for this like hair transplant! In Indians, graying of hair starts in the late thirties. Graying is called premature graying when it occurs before the age of 30 in Indians. What are the causes of premature graying? Hormonal imbalances like thyroid and pituitary hormones, stress, dietary imbalance, any severe illness can all cause premature graying. Stress is widely believed to be the prime cause of premature graying. There is no scientific proof of this but we all know from experience that any sudden stressful period can lead to a lot of gray hairs. Stress can cause this by releasing excess stress hormones which probably cause the graying. Other hormonal imbalances are also known to cause premature graying. Thyroid hormone imbalance, imbalance of testosterone, estrogen or progesterone are all known causes of early graying. Any severe illness like prolonged infections, autoimmune diseases etc can also cause premature graying. What are the treatments for graying of hair? The short answer to this unfortunately is – there is no treatment! There is till today no definite treatment in medical science for graying of hair. When it is due to hormonal imbalance, some reversal can occur once the imbalance is corrected. A good healthy diet, exercise, avoiding smoking and drinking should also help in preventing premature graying. What about the frequent complaints of Guwahatians and people in many other cities and towns that it is the high iron of the water here that leads to premature graying? There is just no evidence for it. Maybe its true and maybe it isn’t. There is no doubt that the present generation is having much earlier graying of hair. Young boys and girls in their twenties already have clumps of grey hair. Perhaps it is due to the increased tensions of the present age, or due to pollution. Whatever the cause, there is only one answer and that is dyeing of hair. There is no other treatment for this, so we all have to go through this.